Quiz your students on 19 capitals of Eastern European countries with this map quiz. Students must match the capital cities to their location on a map quiz. Another quiz requires them to match the capitals with their countries. Study guides are included for both quizzes. May be printed in color or black and white. Includes links to an interactive geography website. Editable. Answer keys included. 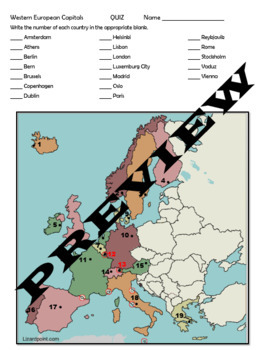 Please note this quiz only covers the capitals of 19 Western European countries. The capitals of Andorra, Monaco, San Marino, Vatican City, and Malta are not required for these quizzes. This file is editable, though, should you wish to label them.